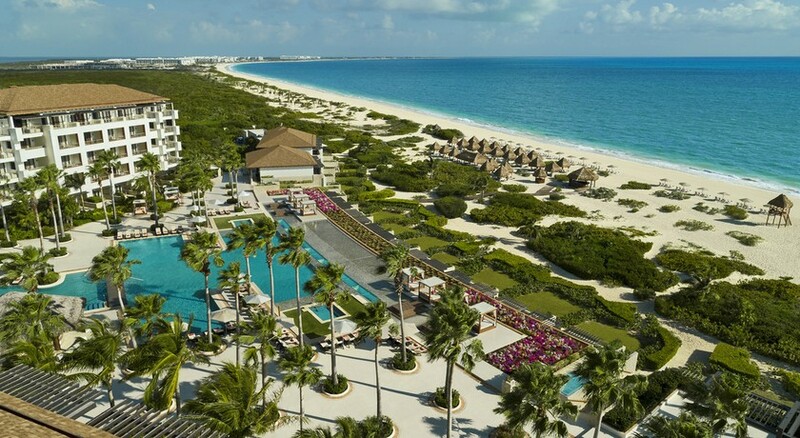 Tucked within a designer golf course overlooking an intimate white-sand beach, is this brand-new Secrets Playa Mujeres Golf & Spa adults only resort. Each stylish and well-appointed suite overlooks the beautiful turquoise sea and if you're on the ground floor, you can walk straight in to the pool from your patio. Perfect for couples, honeymooners or friends seeking a luxurious all inclusive stay, guests can indulge in the world-class spa, huge selection of gourmet restaurants, premium drinks and, of course, the beach which will take your breath away. The outdoor swimming pool will let you have fun in the sun. 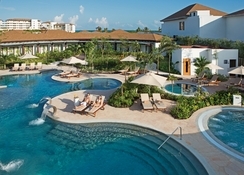 Secrets Playa Mujeres Golf & Spa is ideally located near the Cancun City. Many shopping malls, restaurants and bars are easily accessible from the property. It will be an exciting time for the ones who are fond of luxury shopping, as the Luxury Avenue shopping mall is about 29km from the resort. The Cancun International Airport is about 32km from the resort. 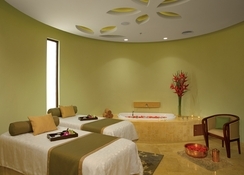 The resort features 424 luxurious rooms decorated in a contemporary style. They feature air-conditioning, private balcony or terrace, flat screen TV, iPod docking station, mini-bar (re-stocked daily), coffee maker, in-room safe, bathrobes, slippers, hairdryer, iron and ironing board and hydro tub. Guests can choose from Junior Suite Garden View, Junior Suite Swim Out, Junior Suite Partial Ocean View, Junior Suite Ocean View and Premium Junior Suite Ocean View. Preferred Club members can avail the enhanced services and are offered better accommodation. 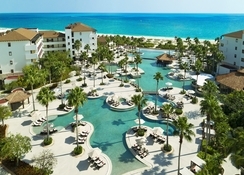 At the Secrets Playa Mujeres Resort & Spa, there are seven reservation-free restaurants to choose from. Market Café is the hotel's main buffet restaurant serving international cuisine and open for breakfast between 7:30am - 11:30am, lunch between 12:30pm - 4:00pm and dinner between 6:30pm - 11:00pm. Oceana is a specialty seafood restaurant open for lunch between 11:30am - 5:00pm and dinner between 6:30pm - 11:00pm. Seaside Grill serves grilled specialties and is open for lunch between 11:30am - 5:00pm and dinner between 6:30pm - 11:00pm. Portofino serves fine Italian cuisine and is open for dinner between 5:30pm - 11:00pm. Bordeaux is open for dinner between 5:30pm - 11:00pm and offers French gourmet dining. El Patio serves authentic Mexican cuisine, it is open for dinner between 5:30pm - 11:00pm. Himitsu is a speciality Asian restaurant open for dinner between 5:30pm - 11:00pm. Barefoot Grill is open for lunch by the pool between 12 noon - 4:00pm. CoCo Café offers speciality coffee and snacks between 6.00am - 10.00pm. 24-hour room service is also available. There are two freshwater swimming pools and four outdoor Jacuzzis. Utilize the fully equipped fitness centre and Secrets Spa by Pevonia offering a range of treatments and therapies at an extra charge. 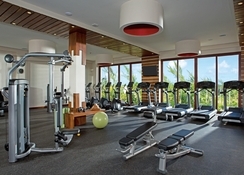 Yoga, aerobics classes and dance lessons are also available exclusively for the guests of the hotel. 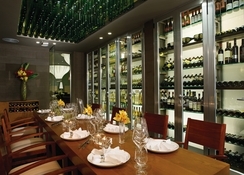 The hotel also offers cooking and cocktail-making classes and Spanish lessons. Other than this, you can also enjoy the big-screen movies on the beach. Take advantage of non-motorized water sports such as kayaks, Hobie Cats, snorkelling, water aerobics and water polo. Play beach volleyball, tennis and euro-bungee near the hotel. With live evening entertainment, theme parties, indoor theatre shows, live music and beach parties, your stay will become even more entertaining and memorable.